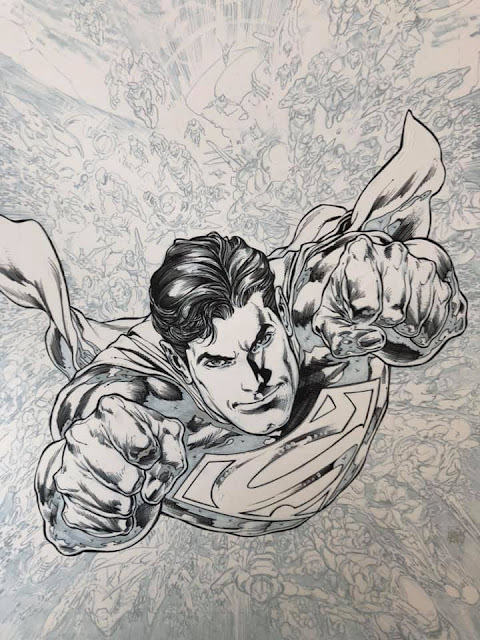 The upcoming to cover to Superman 13, shipping in July 2019, has an iconic cover by Ivan Reis and inker Joe Prado. The colors are by Alex Sinclair. 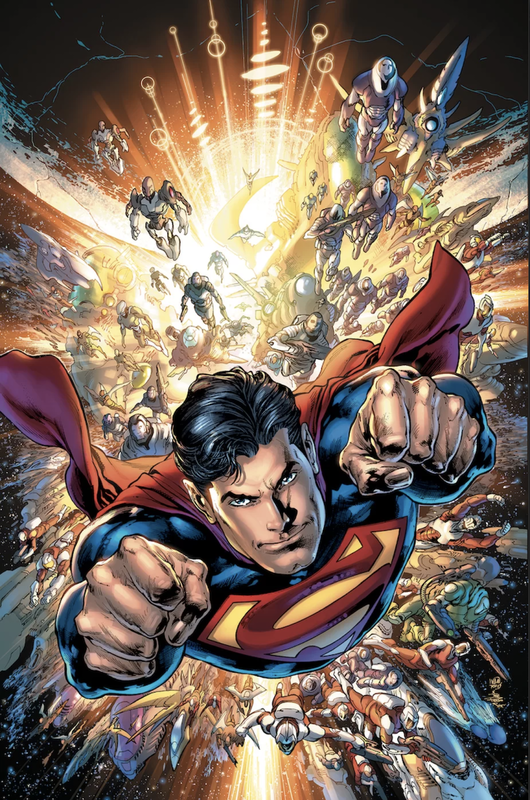 The image relates to the "Unity" storyline where Superman is leading an intergalactic band through the galaxy. I am sure this somehow culminates in the birth of the United Federation of Planets, leading to the Legion of Super-Heroes in the future. Then he goes crazy inking the miscellaneous background characters. Notice that Superman himself does not have all the black ink inside his chest / arms yet. ...and finally there is the fully inked page with the planet / outer soace in the background, the black areas fully inked inside Superman. It pops and creates a depth of field in black and white, even more so in color! These guys are some of my favorite artists at DC and they have been working there over a decade! Nuff Said. SHAZAM! The Many Revisions of The Original Captain Marvel! The movie SHAZAM! is releasing this Friday, April 4th. I've got a case of Shazam fever, looking at various incarnations of The Big Red Cheese since DC Comics started publishing the character in 1973. First, a word or two on the Golden Age Captain Marvel. Fawcett Comics was the original publisher, not DC Comics. He first appeared in Whiz Comics #2 in 1939 (cover dated Feb 1940). The concept was simple: an orphaned boy named Billy Batson takes an unearthly subway ride, where he meets the wizard Shazam. When Billy says the wizard's name, he transforms into the adult hero, Captain Marvel! He was almost launched as a character called Captain Thunder, but another company beat them to that name. Created by Bill Parker and C.C. Beck, the good Captain was an instant hit on the newsstands. He not only appeared in Whiz Comics but also Captain Marvel Adventures and Master Comics. Due to his popularity a 12 part movie serial, Adventures of Captain Marvel, was produced starring Tom Tyler. He soon had a family to help him: first a crippled boy known as Freddy Freeman, who upon saying the name "Captain Marvel!" changed into Captain Marvel Jr., who was so popular that Elvis Presley modeled his look / hairstyle on this character. 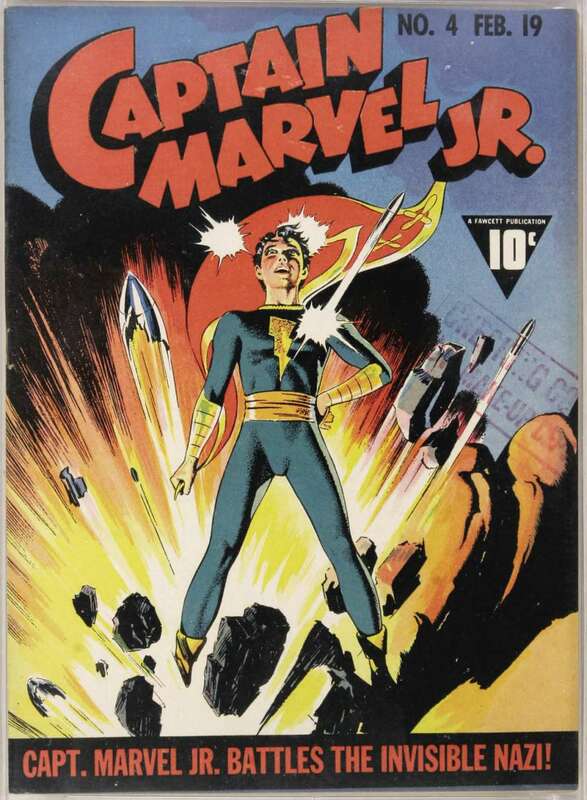 Captain Marvel Jr is a favorite among many fans because of his cool blue costume and the incredible artwork of Mac Raboy. Many iconic covers of this character are from the World War 2 era. 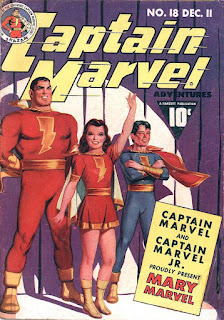 About a year after Junior's debut, Mary Marvel was introduced in Captain Marvel Adventures 18 (1942). Mary was the long lost twin sister of Billy Batson and also able to use the word "Shazam" to transform into a hero. She was featured in Mary Marvel Comics and Wow Comics. 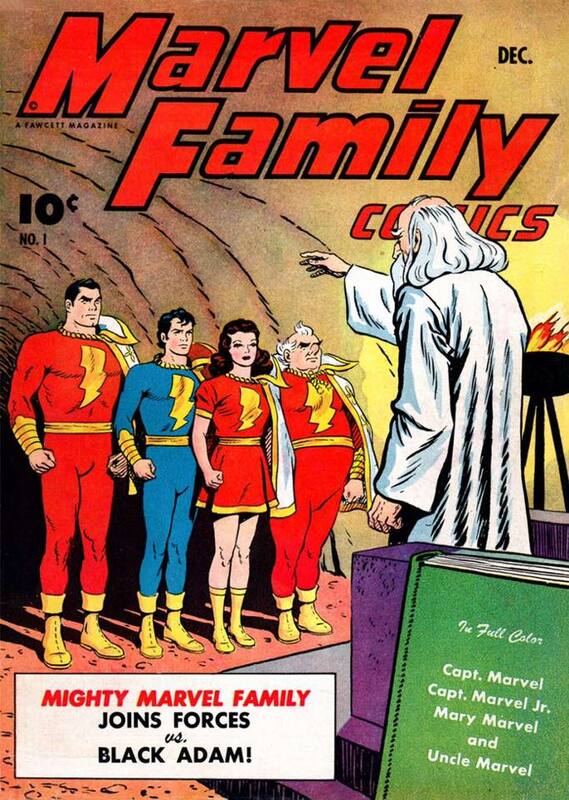 Suddenly Billy Batson had a new found family with these two by his side, and there was another title called Marvel Family Comics. What made the Marvels so popular? I believe it was Chip Kidd who said: "Superman was Power; Batman was Menace. Captain Marvel was Charm." Captain Marvel stories were fantastic in nature and also full of whimsy. There was Uncle Marvel, an overweight older guy who had no powers but pretended he did, doffing his street clothes to reveal his red uniform. Uncle Marvel, by the way, was the true hero of Marvel Family Comics #1, the first and only golden age appearance of Black Adam. There was also Mr. Tawky Tawny, a talking tiger who was a dapper dresser. One of my favorite stories has Tawny trying to lose weight with the assistance of Captain Marvel; unbeknownst to both of them, Tawny is hypnotized at night to eat a buffet table of food, spoiling all the benefits of his exercise regime. Many of the stories were written by Otto Binder, later a writer for Mort Weisinger on the Superman comics. DC Comics launched a lawsuit against Fawcett for copyright infringement in 1941. This lawsuit dragged on for years. By the early 1950s, superhero comics were on the decline following the WW2 era. 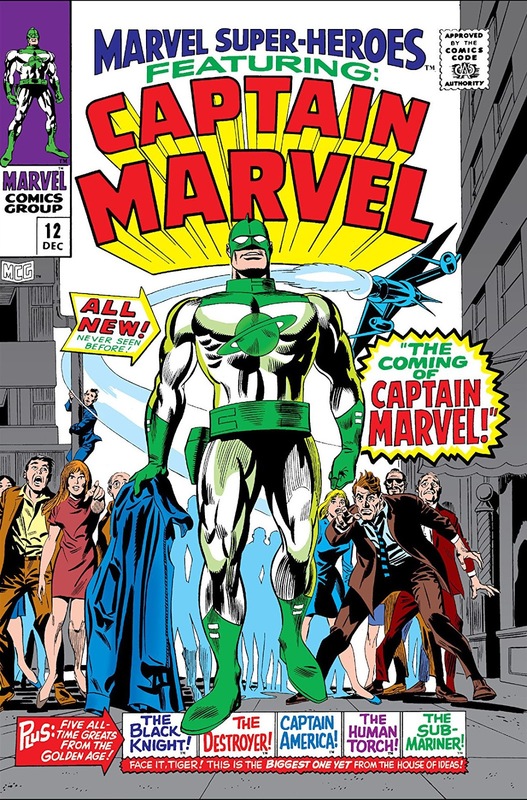 Combined with the lawsuit and declining sales, Fawcett took a settlement with DC Comics and agreed to stop publishing Captain Marvel. 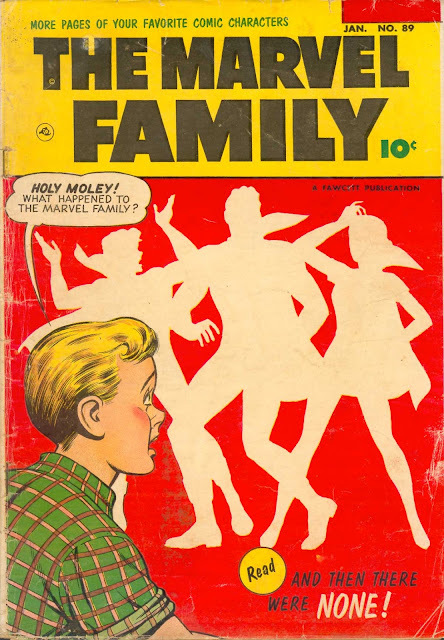 The last Fawcett publication featuring the Big Red Cheese was The Marvel Family #89 in January 1954. Strangely enough, only their silhouettes were on the cover along with the caption And Then There Were None! Mar-Vell: Not the Captain Marvel we are talking about here!! 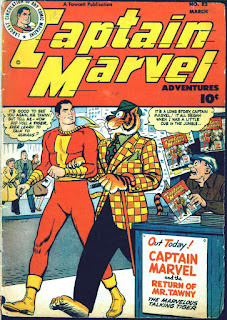 Between 1954 and 1973, there were no comics published with the Fawcett character Captain Marvel. What happened during this period of time? A little company called Marvel Comics became very popular. 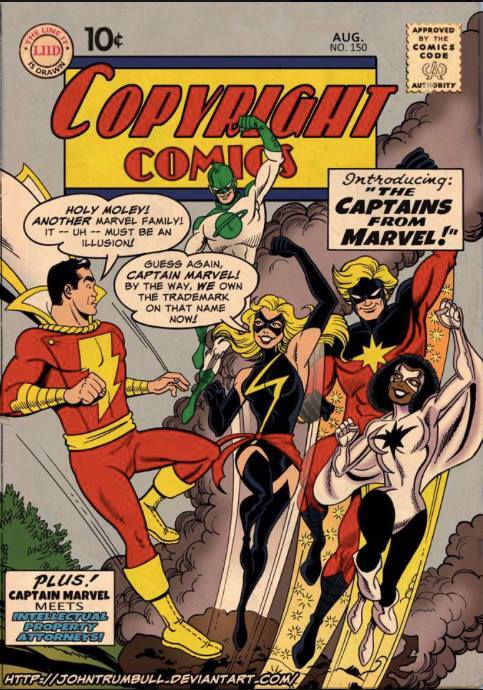 The publisher Martin Goodman decreed that they should publish a character with the name Captain Marvel in order to establish a trademark. From this point on, any comic featuring the original Captain Marvel would be unable to use that name on the cover. 20 years after he was last seen, DC Comics licensed the rights to Captain Marvel back from the company they previously sued, Fawcett. SHAZAM #1 was the debut issue in 1973, with a cover by three artists: C.C. Beck, Murphy Anderson, and Nick Cardy. 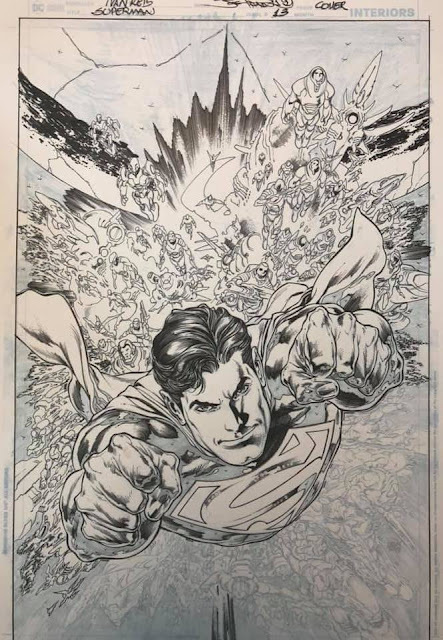 I am guessing Cardy must have designed the cover with Anderson inking over Superman to give him the standard "house" DC look. You will notice the subtitle here says "The Original Captain Marvel" but this was soon changed to "The World's Mightiest Mortal" due to legal action by Marvel Comics (protecting their acquired trademark). He was still called Captain Marvel in the stories. DC kept the continuity stretching back to the 1940s by giving CM his own Earth-S in the DC Multiverse. He would cross-over to meet (or fight) Superman and the Justice League. 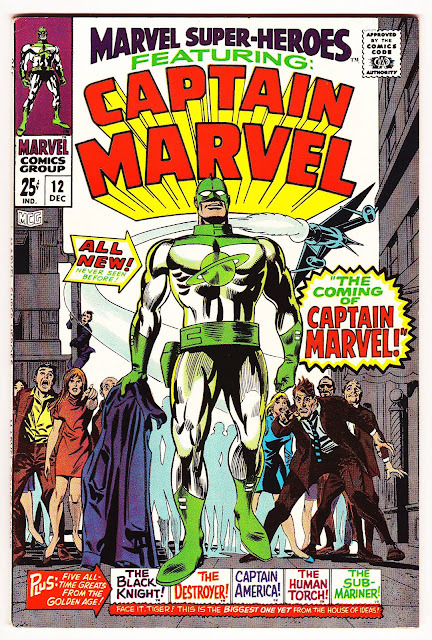 Publisher Carmine Infantino was looking for a way to boost sales and hoping a revival of "The Original Captain Marvel" would be the way. Sadly, it was not as big a hit as Superman or Batman, with C.C. Beck leaving the series early on, due to disagreements with the stories by Denny O'Neill. However, in terms of licensing and merchandising, it was probably was a success. 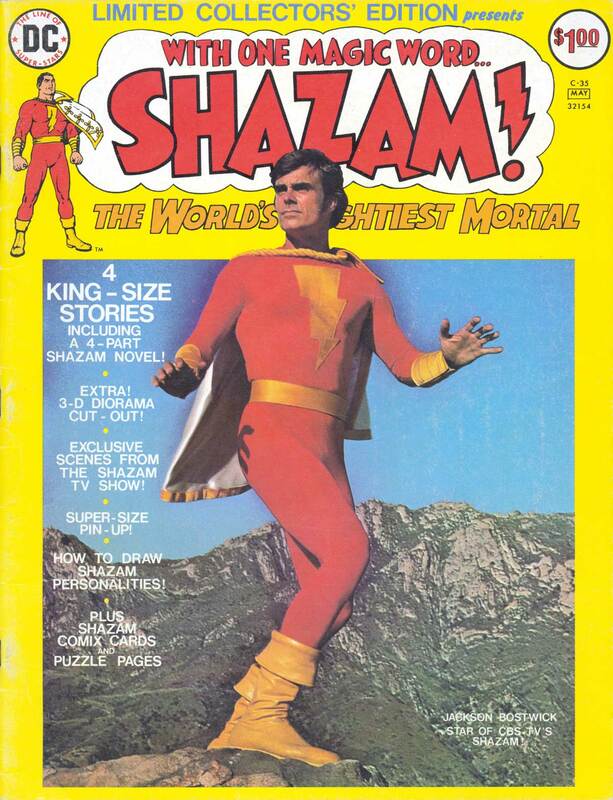 In 1974, a Saturday morning live action SHAZAM! show was on Saturday mornings. It was successful enough to last three seasons. There is a great article on this show in Retro Fan #4 by Andy Mangels. There were three treasury sized SHAZAM Limited Collectors Editions published, each with great classic CM reprint material chosen by E Nelson Bridwell. 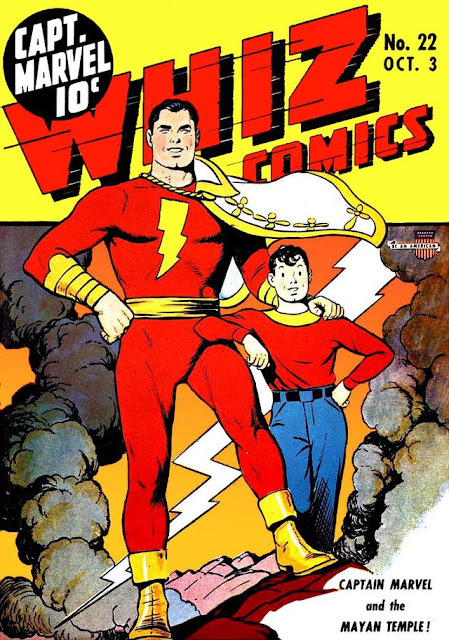 Shazam the color comic lasted until 1978. Stories continued after the title was cancelled, and he made various guest appearances. Then came the Crisis on Infinite Earths in 1986. The Crisis led to SHAZAM! The New Beginning! by Roy Thomas and Tom Mandrake in 1987. This version of Captain Marvel resided on the newly integrated Earth with Superman, the Justice League and other heroes. Thomas had long wanted to do a revamp of Captain Marvel and he had one important change to make. Previously, Captain Marvel and Billy were two separate people, though they shared speech patterns and attitudes. Captain Marvel was definitely an adult, not a goofball. 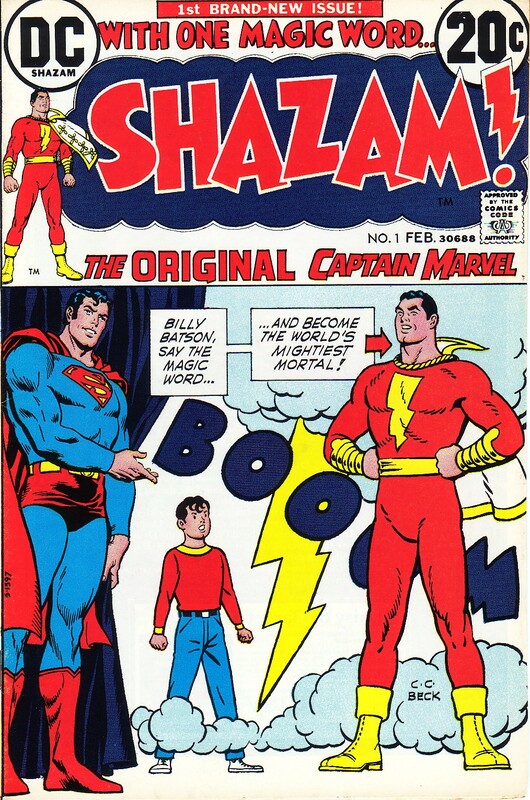 As he says in the introduction on the first issue: "...in this first issue...we have a 15 year old Billy Batson who is definitely in command of the nigh-invulnerable body of Captain Marvel". This change was immediately echoed post-Crisis in all DC Comics continuity. DC also gave Captain Marvel a prominent role in the newly rebooted universe. 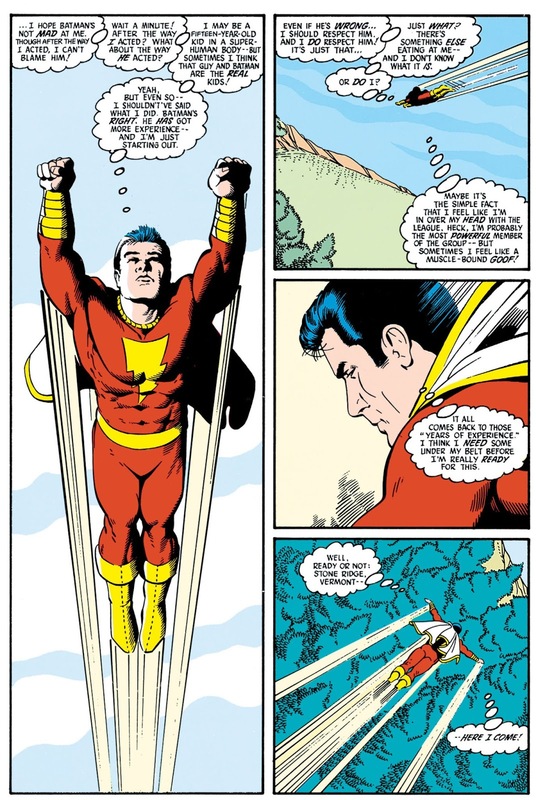 In the Legends six-part mini-series, Captain Marvel was introduced on par with Superman and Wonder Woman. Captain Marvel was part of the new Justice League International by Keith Giffen, JM DeMatteis and Kevin Maguire. The humor centered around his youthful expressions, especially around Guy Gardner. This was definitely a kid feeling out of place among a super-team of adult powered heroes. Looking at the various reboots of the character, you get the feeling that DC had never quite figured out how to properly exploit the character, which they had now fully bought from Fawcett. 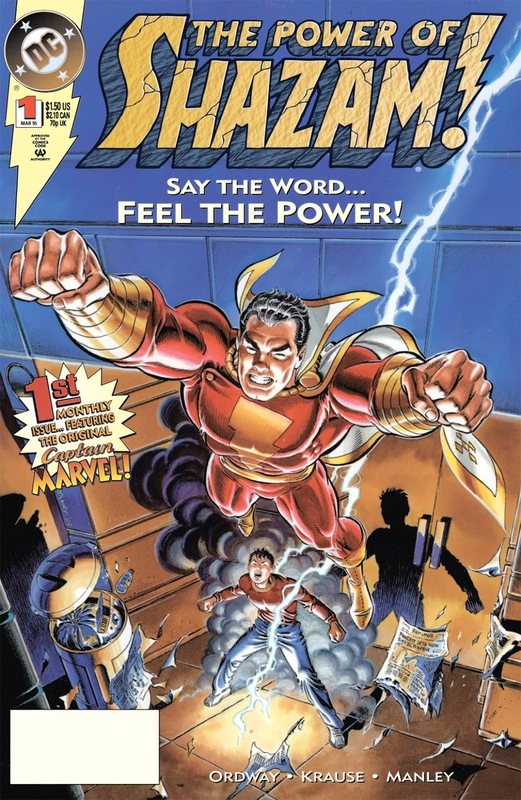 The post Crisis version lasted until 1994, when Jerry Ordway released The Power of Shazam hardcover graphic novel, which completely rebooted Captain Marvel yet again. 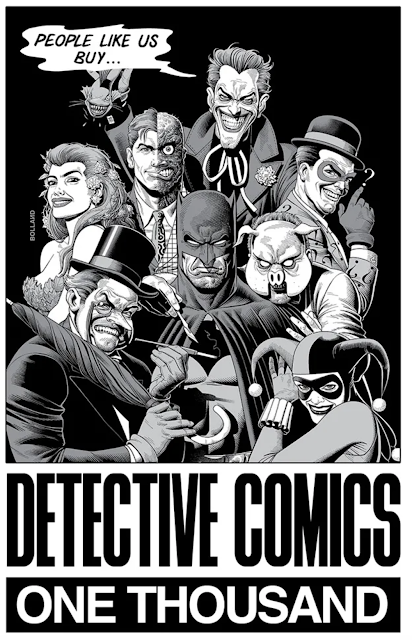 The graphic novel itself was lushly illustrated by Jerry Ordway. I just noticed now that this is available to read for free on Kindle Unlimited. I haven't fully re-read this yet, but it seems a bit darker than most Captain Marvel tales. Black Adam's origin was changed so that he worked alongside Billy's parents on an archeological dig site, stabbing them to steal treasure and making orphans out of Billy and Mary. 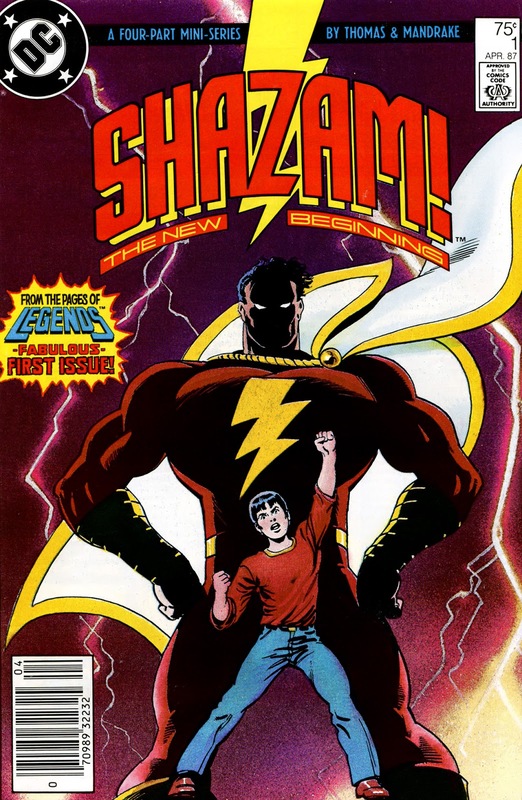 The graphic novel was a precursor to The Power of Shazam monthly series in 1995. Jerry Ordway provided gorgeous covers for the series with interior art by Peter Krause and Mike Manley. This series lasted for four years. Jerry Ordway took over as penciller on issue 42, before the series ended with issue 47. 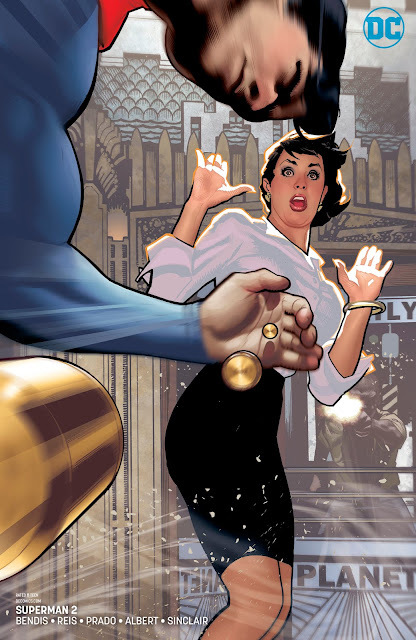 A 48th issue was released as part of the Blackest Night event week in 2010. 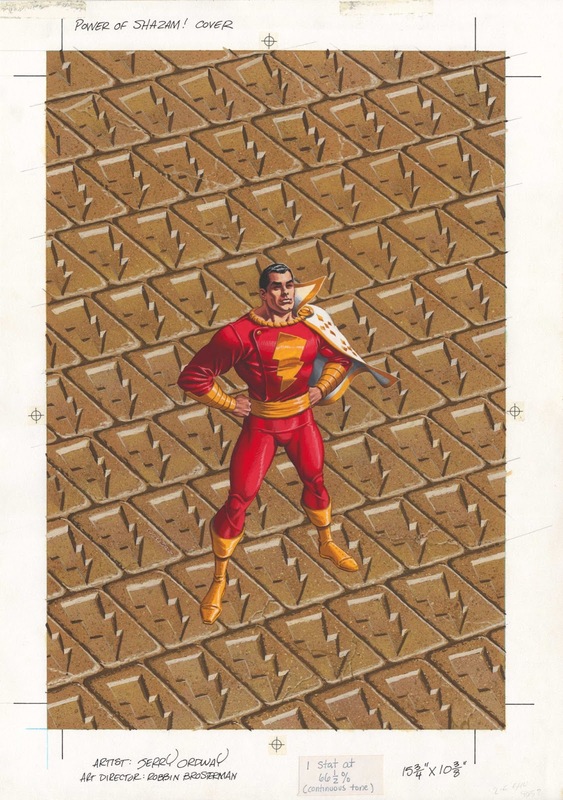 Captain Marvel was a big part of the Kingdom Come prestige series in 1996, showing up to fight Superman as the world threatened to burn around them. An Elseworlds story written by Mark Waid and painted by Alex Ross, who definitely loves the Big Red Cheese. There have been numerous Superman vs Shazam battles since the character was introduced to the DCU. In this story he says the magic word "Shazam!" and dodges before the lightning strikes, having it hit and injure Superman (who is vulnerable to magic). This same trick was used in the Justice League Unlimited cartoon years later, in a slightly different way. 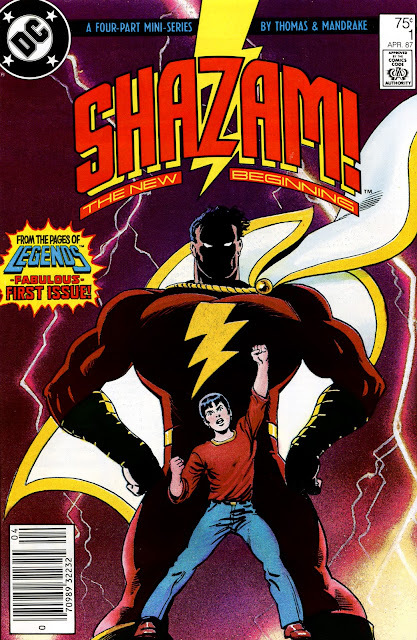 Alex Ross and Paul Dini would later produce a treasury sized book called Shazam the Power of Hope in 2003. 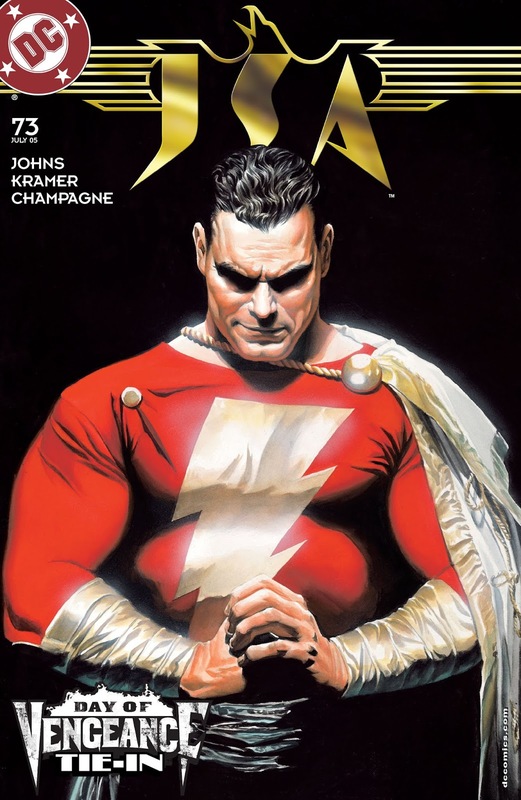 In the next few years, Captain Marvel most notable appearances were in the JSA series written by Geoff Johns. I thought CM fit very well on this team, his personality much better alongside the Golden Age heroes. There was a charming infatuation the Captain had with Stargirl, a bit icky until she realized he was really Billy. The biggest addition to the Shazam mythos was the development of Black Adam's character, making him not a shallow villain but someone with a valid point of view. 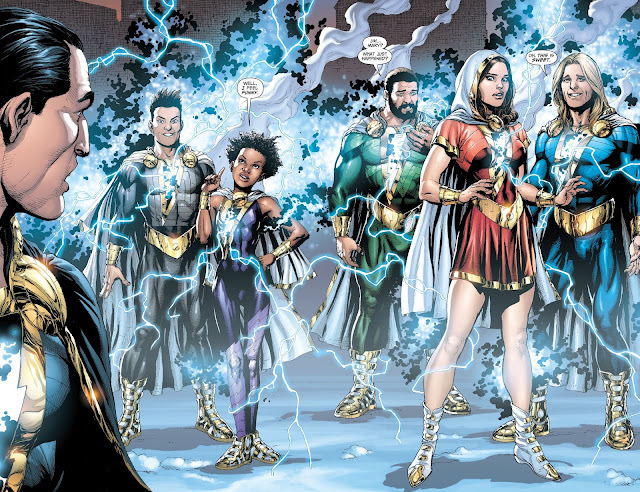 Black Adam started showing up in other series and DC events, turning him into one of DC's greatest conflicted characters. He was one of the main characters in the 2006-2007 52 weekly series, co-written by Geoff Johns, which also featured Mr Mind, a classic Shazam villain. Judd Winick, a big fan of the Marvel Family (who had used Captain Marvel Jr for a while in his Outsiders series), launched The Trials of Shazam! in 2006. This attempted to shake up the status quo in many ways. The wizard Shazam had died after the Day of Vengeance mini series; Billy must become the wizard (even getting long white hair) while Freddy Freeman must take up his mantle on Earth. Another more important change was that Captain Marvel and the Rock of Eternity were now at the heart of the magic side of the DC universe. In this first issue, Zatanna makes an appearance. While Captain Marvel's stories always involved fantasy, this went a step beyond, involving him deeply in the magic cosmos of the DCU. 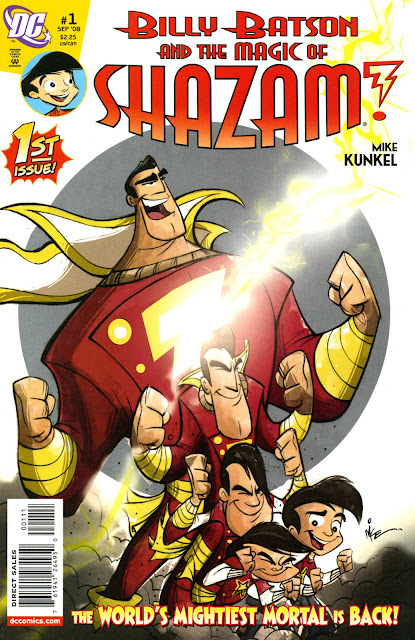 In 2007, DC published a four issue square bound mini-series by Jeff Smith: SHAZAM! The Monster Society of Evil. 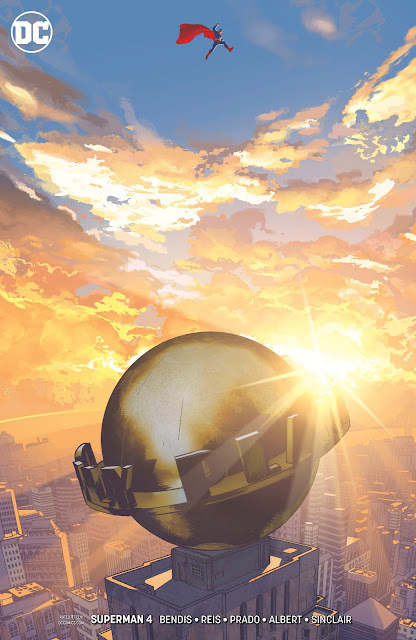 If the regular in-continuity Captain Marvel was now saddled with adult responsibilities, this new out of continuity story took Billy Batson back to his roots and made him younger than ever before. This pre-teen version of Billy, homeless and living in poverty, was drawn in a way that would be perfect for animation. I hadn't read this until last week, it is quite a fun read, and Mary Marvel shows up as well. This can also be found on Kindle Unlimited. I think at this point you can see a lot of indecision on the part of DC editorial on how to handle the Shazam property. Is he for kids or adults? As time goes by, the answer is that any character can be targeted for any market: kids/pre-teens/late-teens to adults. As long as there is an imprint and branding, the characters are malleable. 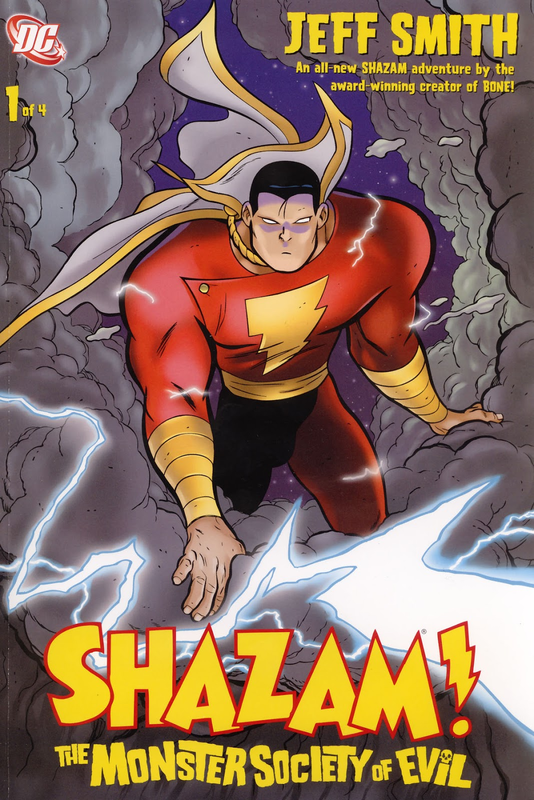 In 2008, a new series aimed at kids was launched from the Johnny DC imprint: Billy Batson and the Magic of Shazam! I have to admit this isn't my cup of tea, but for kids under 10, the artwork of Mike Kunkel might be the thing. It's drawn in a very manga/sketchy style, very light hearted and fun. This lasted 21 issues until 2010. 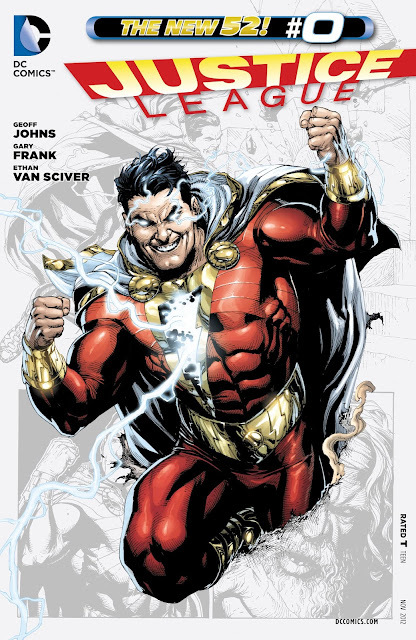 In 2011 there was not a relaunch but a re-imagining of the Shazam mythos in the Flashpoint mini-series by Geoff Johns and Andy Kubert. 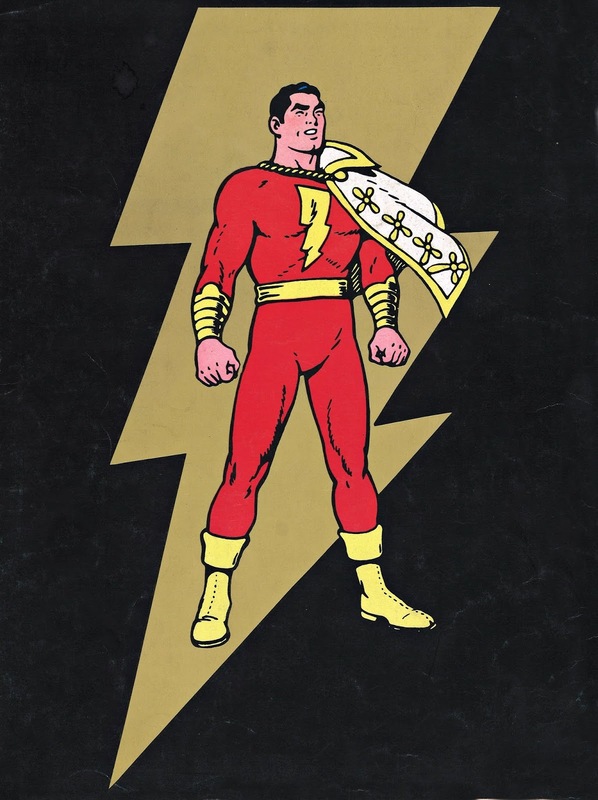 In this alternate version of DC's superheroes, Shazam is known as Captain Thunder (which was his original name in the ashcan of Whiz Comics 1). The powers of the gods reside not only in Billy, Mary and Freddy but also in new kids called Darla, Pedro and Eugene. When they say the word SHAZAM! they all transform into one being, Captain Thunder. When we read this at the time, we probably thought, okay, a cool alternative take on Shazam; it was also an evolutionary step towards the current version aimed at movie theaters. Flashpoint was the trigger event for DC Comics New 52 relaunch. This came with brand new character designs for Superman, Wonder Woman, Flash, and many other characters. While Shazam was not part of the initial Justice League story, his new origin began serialization (as a backup feature) in JL issue 7 (2012), story by Geoff Johns, artwork by the incredible Gary Frank. 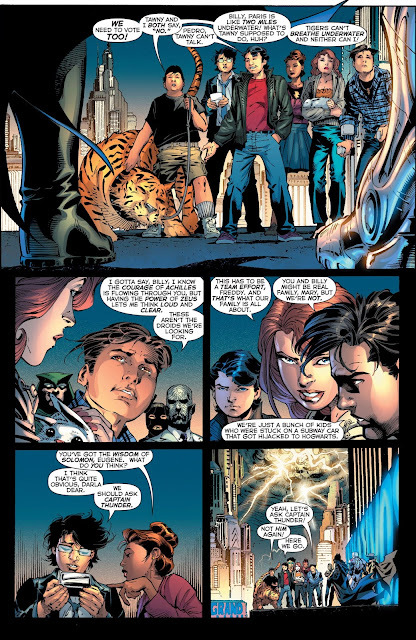 This "New 52" origin serves as the basis for the story of the 2019 Shazam movie. The look of the new character, now never to be called Captain Marvel or Captain Thunder again (his name is Shazam) was controversial for long time fans of the Big Red Cheese. The Golden Age costume for Captain Marvel was designed to make him look like a military man. His cape was clasped on one side and it dangled on one side. It was also very short. He had five rings on his arm bands, the mark of a captain. The folds of his boots are also very military like. Compare that to the Gary Frank costume: the cape is freakishly long and he now has a hood. The hood bothers me more than anything! The cape is held to his chest with two clasps (in the movie these have tiger images). Lightning pours out of his chest emblem and it glows with power even after the transformation. His boots also seem to have lights in them. 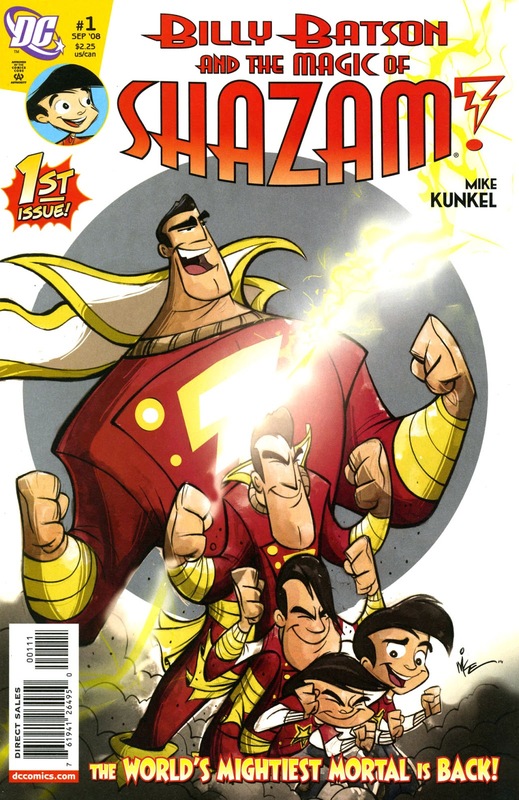 Shazam also has the power the zap stuff with lightning, which never happened before. I am not sure why he needs this power. I guess it would help in a fight with Superman? 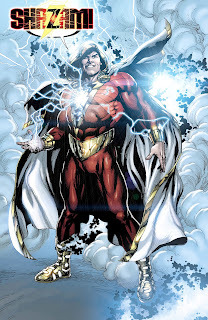 What the new Shazam does have in common with the earlier Roy Thomas reboot is that this is fully Billy in the body of a super powered adult. The new origin basically does read like a movie pitch or treatment: Big (the Tom Hanks movie) combined with super-heroic fun. And it is fun, if you can let go of the classic Captain Marvel look. The Shazam origin story took a while to be completed. It ran in Justice League 7-11, then continued in the 0 issue (seen above), then resumed in JL 14-16, finally climaxing in JL 18-21. It has been collected in a couple of editions and reads much better in one sitting than over a year as it did back then. 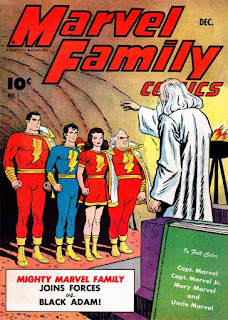 The story contained a big twist on the Shazam legend: Billy not only shares his magic powers with adopted sister Mary and friend Freddy Freeman - but also his new friends Darla, Eugene, and Pedro. These are the same names of the kids we saw in Flashpoint. It is a clever way to have kids from other backgrounds share the fun of transforming into an adult. In the comics this hasn't been fully explored yet, so we don't know what the differentiators are between their powers. We know Eugene has control over electronics, which some may consider a poor Asian stereotype. I think Darla is the cutest and in the movie she may work the best. The one character design I cannot stand in the 2013 revision was my favorite from the Marvel Family: Freddy / Captain Marvel Jr. I cannot believe they turned him into a blond haired kid! The reason is probably from a design standpoint, they did it to differentiate him from Eugene (with dark hair) and Pedro (with brown hair). 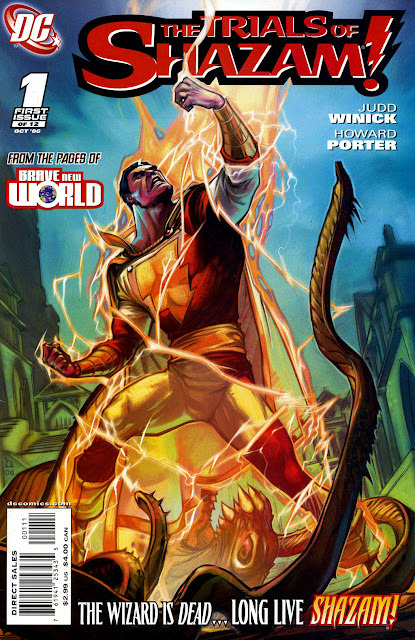 This has led us to the newest ongoing Shazam series, launched in November 2018 last year. 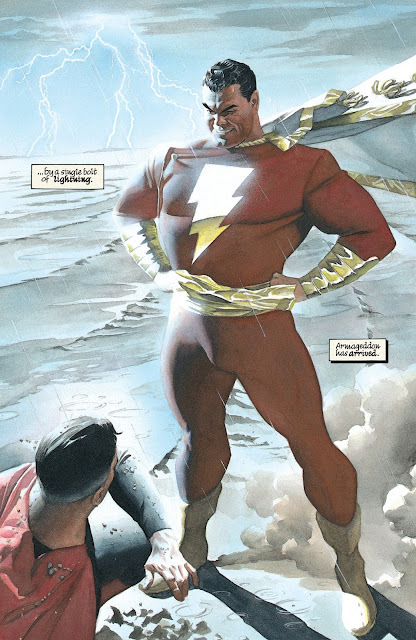 After the Shazam origin was finished in 2013, the character appeared in Justice League stories, and a regular ongoing was sure to follow. It took five years due to various scheduling issues. 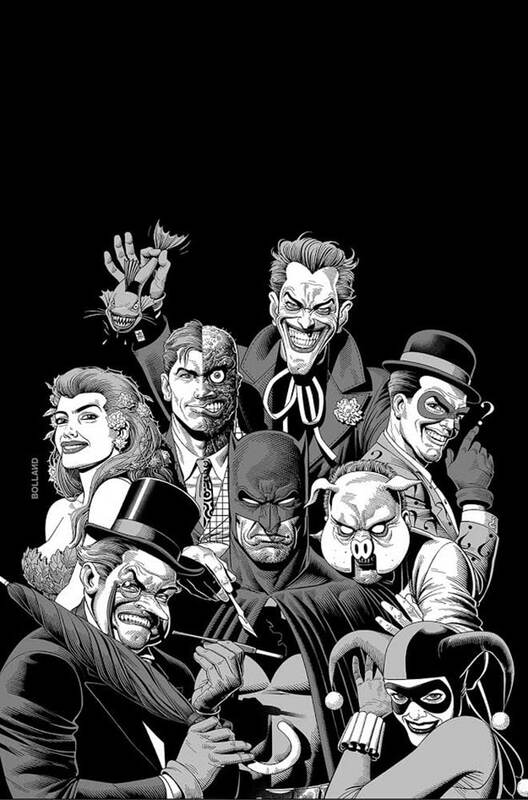 Gary Frank was working on Batman Earth One graphic novels and then went onto the Doomsday Clock miniseries which has had numerous delays. 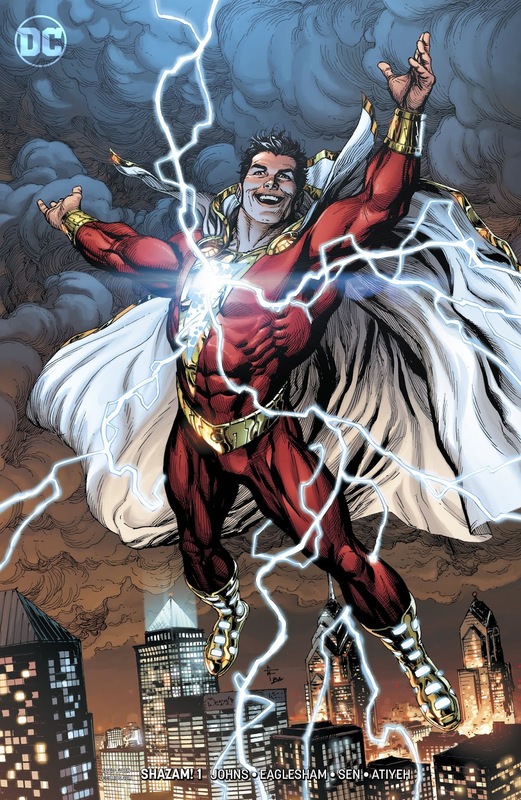 The new monthly Shazam series is drawn by Dale Eaglesham, a longtime Johns collaborator from his JSA days. The first story arc seems targeted right at the heart of young adult readers, where the Shazam family travels to the Magiclands to explore realms we haven't seen before in the DC Universe. Finally, there is one more version of Captain Marvel that DC launched in 2014. 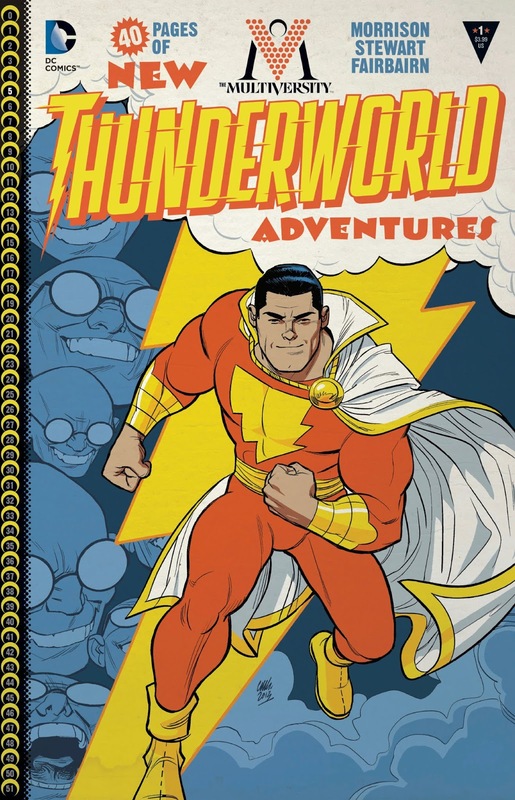 Thunderworld Adventures 1 by Grant Morrison and Cameron Stewart. This was part of Morrison's Multiversity project, a device that allowed him to tell unique stories from one of the 52 Earths in DC's multiverse. 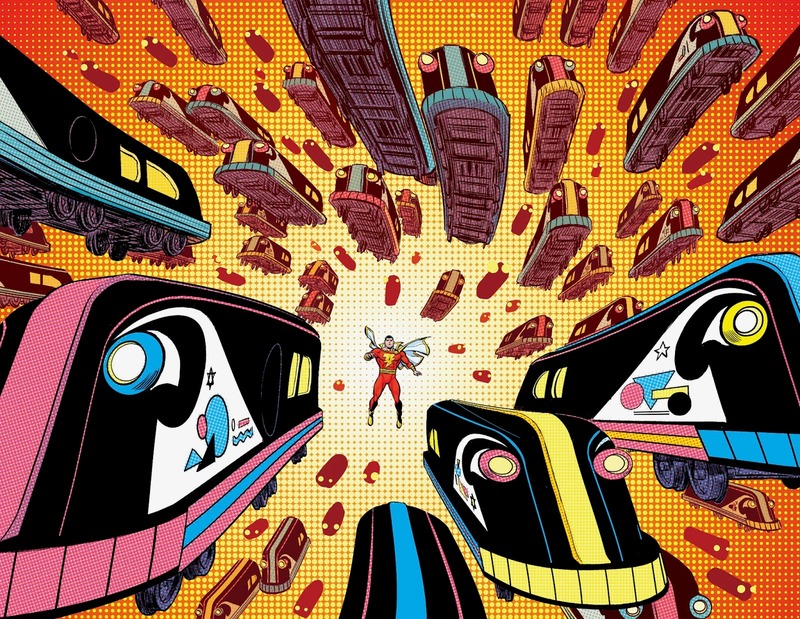 Morrison placed Captain Marvel on Earth-5, which I think works best for the character, to operate on his own playing field where magic and whimsy can rule. If he wants to meet Superman he could always cross a dimensional barrier, like going on vacation. This story was full of action and great artwork. Sadly, I don't think we will see Earth-5 again any time soon, now that the monthly Shazam comic is being published. I do like knowing there is a separate Earth out there, reserved for the adventures of the Big Red Cheese. In a few weeks we will see the publication of Detective Comics 1000. With dozens of variant covers, per usual! 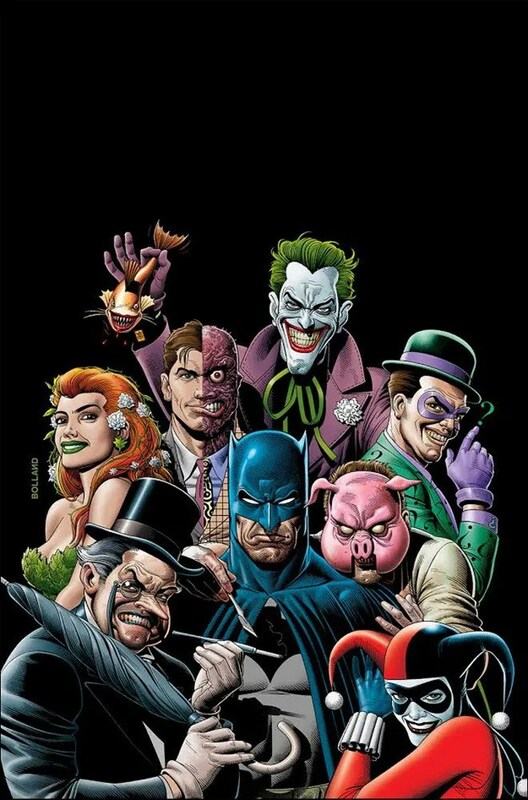 Brian Bolland's variant cover features a colorful look at Batman's rogues gallery. Bolland hasn't done much work lately, he's pretty much retired, but his skill is still tremendous. Does this cover seem somewhat familiar to you? It should. 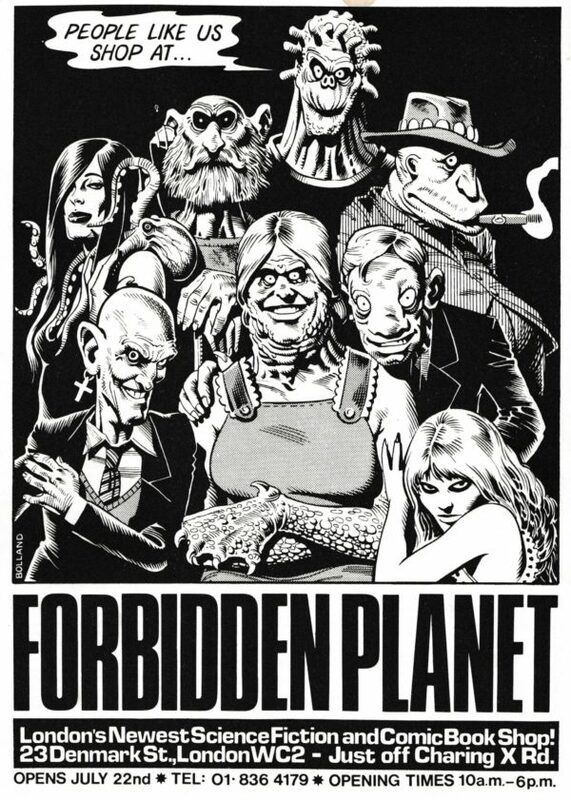 It is based on an ad that Bolland did for Forbidden Planet, decades ago. It is quite a great store, I visited in London a few years ago. The black and white version of this image was mocked up to resemble the ad. The full image in black and white glory. Nuff Said! Marvel's Captain Marvel (created in 1967) gets released on March 8th. DC Comics' Captain Marvel (created in 1939), aka Shazam, gets released on April 5th. 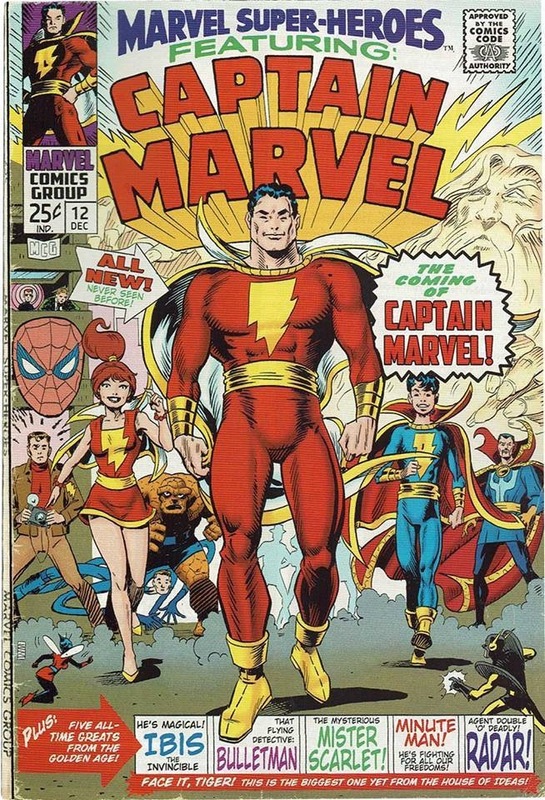 There is a history behind the original Big Red Cheese Captain Marvel and how Marvel Comics was able to attain the trademark in the 1960s which is explained well on MentalFloss. How ironic that both characters have movies made at the same time. 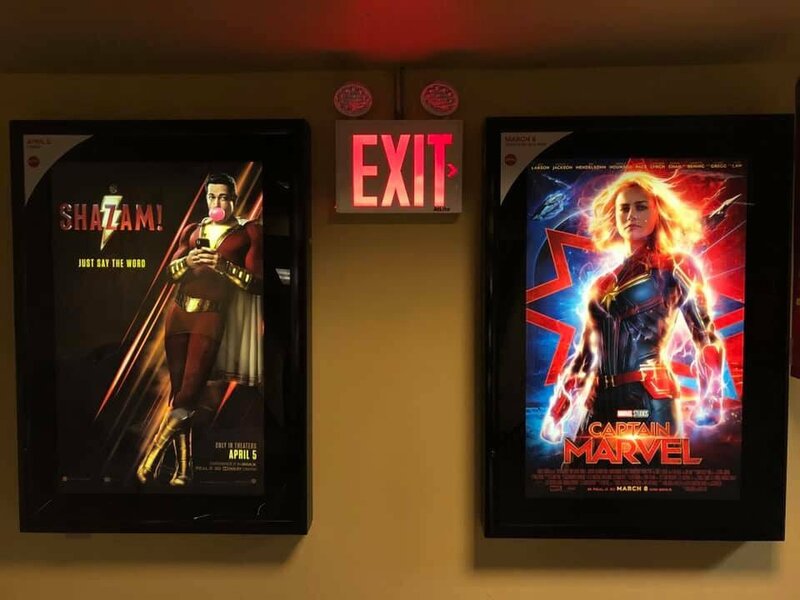 Someone in the know put these two movie posters together inside a theater. John Trumbull, a writer of comics history for Two Morrows, created this gag cover showing the various versions of Captain Marvel, which is hysterical! You've got the Big Red Cheese facing the four Marvel characters who had the name. Carol Danvers is wearing her Dave Cockrum designed costume which Brie Larson is glad she did not have to wear in the movie. There's the original Mar-Vell in both his costumes and Photon / Monica Rambeau as well. I recently read Robin by Dave Itzkoff, which was published in May 2018. I think anyone who first saw Robin Williams doing standup during the 1970s or that first year of Mork and Mindy will never forget the impact he made. A rapid fire mouth & imagination, I laughed so hard. I took pride in the fact that he spent a lot of time in Northern California (high school in Marin, theater & stand up in San Francisco). I’ve always wondered about his marriages, friendships, career ups & downs. This book has all these details. Knowing how Williams took his own life, you see some warning signs with his substance abuse and problems with depression. I really connected with the description of Robin's childhood / early teen years where he was mostly isolated in his room, playing with his collection of toy soldiers & figures (for me, comics and science fiction), watching comedy on TV and rehearsing bits on his own. One of my fond memories of my father was watching Jonathan Winters on TV and both of us laughing at Winters crazy humor and impressions. Robin Williams was watching those same shows and getting inspired to turn into a younger even more manic version of Jonathan Winters. And then, about to enter his later teens, Robin moves to California with his family and encounters a different type of world, just like I had done with my family. Quite a few people that Itzkoff interviewed in the book felt that Robin kept his humor / impersonations as a way to distance himself from other people. I don't think that is a unique situation, many standup comics and people in the entertainment business display the same characteristics. The biography of Johnny Carson by Henry Bushkin reported that he was much the same way. You get a real sense of what it was like for Robin to work in Los Angeles during the Mork and Mindy years, working comedy clubs at night after the TV show, staying up until dawn partying in various adjacent towns, fueled by cocaine. The movie Popeye was supposed to launch Robin's movie career and it was a failure, a terrible mismatch directed by Robert Altman. He didn't really have a smash movie hit until Good Morning Vietnam in 1987, but along the way he did interesting work in films like World According to Garp, Awakenings and Moscow on the Hudson. After 1987 it seemed like Robin could do no wrong until the infamously bad Patch Adams movie in 1998. The last few chapters are heartbreaking. On and off again bouts with alcohol and drugs took a toll on Robin's second marriage. He had a third wife and was happy for a while until Lewy Body disease affected him (which they initially thought was Parkinsons). Robin took a job on a TV sitcom, The Crazy Ones, mostly for the money, but it wasn't successful. I couldn't help but remember the movie Robin made with Bob Goldwaith called World's Greatest Dad. His son in that movie hangs himself in his room, much like Williams himself would do later on. 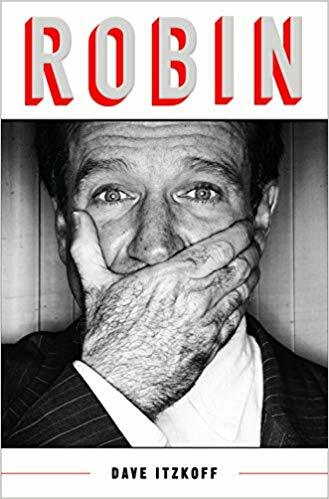 The book is not all sad, there were so many brilliant points in Robin's career and family life. If you're a fan like I was you will enjoy reading it. Nuff said. Adam Hughes has always been a craftsman and one of the clever designers of comics covers for the past decade or so. He's great at drawing women but even in his convention sketches he has a sense of whimsy. Starting in 2018 with the latest relaunch of Superman he has done some spectacular work with the character. This cover to Superman 1 was a doozy - with Superman completely bursting out of a telephone box to save the day. Of course there are no more public telephone boxes, at least in my area of the world. I loved this image so much I use it as a watch face on my Apple Watch. The cover to Superman 2, when I first saw it, took me a while to grok completely. Your attention first goes to Lois throwing up her hands, then to the bullet, and Superman's blurred figure in the foreground gives you a great impression of his super-speed. Faster than a speeding bullet! 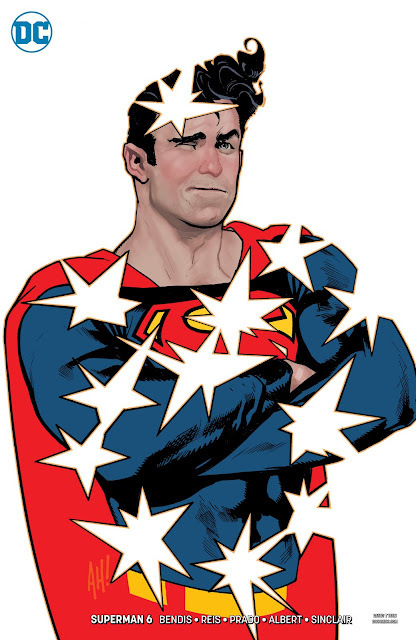 Superman 3 cover was Adam Hughes' take and on the shirt reveal for the chest emblem. Since that had been done a hundred times before (most notably on the Man of Steel 1 cover by John Byrne), Hughes decided to take it back a few more seconds to the removal of the tie. Thanks to modern techniques we can see the S symbol below his white shirt. Well this is also a daring and unexpected cover because Superman is so tiny and barely recognizable at the top. It's a glorious image of the Daily Planet at sunrise or sunset. I think mark chiarello, the Senior VP Art Director at DC Comics (who was sadly lost that position recently), deserves credit for the success of these variant covers. By removing the logo entirely such a design is possible. And you can see what Hughes was going for, capturing Superman to match the classic motto: Able to leap tall buildings in a single bound! ...Superman 32 from 1945, by Wayne Boring. There are even coffee mugs with this Boring cover, which I found while Googling for it. Superman 6, probably my least favorite out of this set, but still humorous, showing bullets bouncing off his head and body. I don't connect with it that well because he looks a bit goofy, his hair looks funny, and why is he wincing? Also I wish we saw the bullets instead of the star effects. After issue 6, DC & AH! took a break. 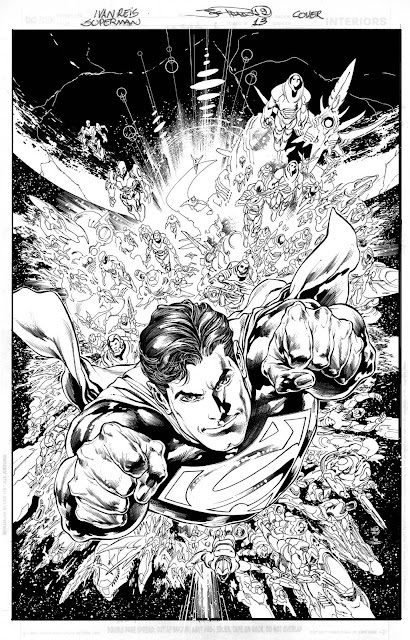 Superman 7 variant was by David Finch, issue 8 was by Rob Liefield. I believe he starts again after that, I have seen images and they are very good. I will follow up later with a future post. Nuff Said!